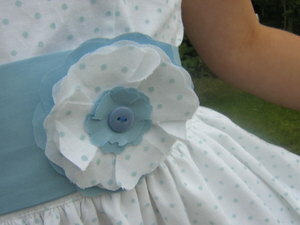 First up, I made this little flower brooch - modified a little from Blair's tutorial. 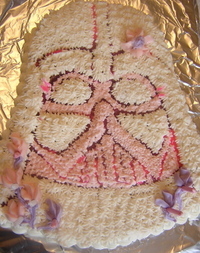 Here is the "Darth [Princess]" cake. She wanted a Darth Vadar cake (I have my mom's old cake pan) but making it 'realistic' kinda freaked her out - so joking, I said we could make it all pink and purple - and she loved the idea! I think it's pretty funny. It would have been more pink and less white, but I'm trying to use less food coloring. 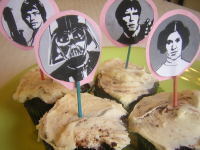 I didn't make it gluten-free, since the pan has so many crevices I didn't think it would work, so I just got out some gluten-free cupcakes from the freezer (for Thomas) and added these quick little Starwars picks (printed from starwars.com). 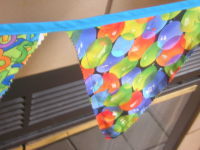 Here is our birthday bunting! I originally thought it would just be for the dining room window, but for some reason I cut out too many flags, so it ended up being enough for the window and the mantel! Perfect. I bought the balloon fabric, the rest is stuff I already had. 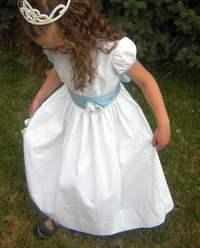 It reverses to 'boy' fabrics! It has lots of blues, reds, and greens. 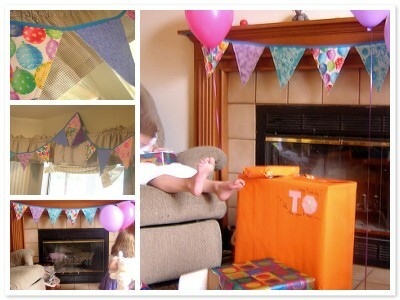 So this is our new birthday decor for all birthdays! I love the idea of reusing this, and it looks really fun! We'll see a whole new look come November for Thomas' birthday. I did end up putting a layer of muslin in between the flags, too - so you wouldn't be able to see through to a different pattern. Thank you for the birthday wishes for Princess - she had a great day, and will be dressing her dolls and playing Playmobil all day. I doubt I'll see her much. Maybe if she gets hungry... there's always leftover cake!